The Art of Elegant Hand Embroidery is a love note slipped into the pocket of a dear friend. Tinged with the sweetness of nostalgia and heavy with the scent of old-world charm, it is a quiet celebration of everything dainty and sweet. Addressed to the artist-as-gardener, this instructional tome is an ode to the small natural wonders that bring communities together—the lush and lively flora that tangle their way up in bright spurts of celebratory color in every Spring garden. Needle artist Janice Vaine expertly guides readers through stitching and appliqué lessons that range from the basic backstitch to more involved appliqué and embellishment techniques. Though basic knowledge of sewing is a prerequisite for this book, the user- friendly layout that includes step-by-step instructions, diagrams, as well as vivid, close-up photographs of the desired stitch or design make it possible for a beginner to benefit from the lessons provided. Of particular strength is Vaine’s warm and gentle instructional voice. Each lesson is introduced with a short note that includes the history behind the design element followed by the variety of uses for that particular stitch. At once clear and animated, Vaine’s voice exudes her passion for her work and serves as inspiration for her readers. Divided into five chapters, the book allows thorough exploration of each stage in needle artistry—familiarization with the required supplies, appliqué and embellishing techniques, block patterns for quilts, completed quilts with Vaine’s designs, and an enclosed pattern DVD. 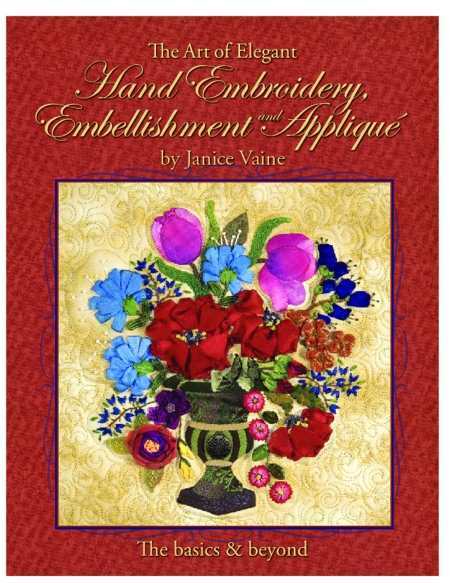 The sheer variety of Vaine’s stitch lessons and embroidery designs makes this book attractive to even the most seasoned needle artist. Though some of the designs can seem dated (floral wreaths do have that grandmotherly appeal), the collection is full of delightful block patterns that stitch together the whimsy of watering cans and wheelbarrows with the tart appeal of pineapples and kiwis. This book—beautifully constructed and carefully presented—creates a pleasurable, almost tactile reading experience rather than functioning simply as an instructional manual. The spiral binding is a practical measure that allows pages to lie flat for easy reference while crafting. The scrolling headers on each page are paired with tapestry-inspired backdrops that immerse readers into an era gone by. The Art of Elegant Hand Embroidery will appeal to beginner and experienced needle artists and will make a valuable addition to any crafter’s shelf.